Every 14 months, Pacific Northwest experiences a seismic event called a "slow slip" that increases the risk of the so-called "Big One." B.C. is headed back into another one of its riskier seismic seasons, raising the risk of "The Big One," earthquake experts say. Every 14 months, the Cascadian subduction zone — which runs from northern Vancouver Island down to northern California — experiences what seismologists call a "slow slip." This year's slip has already kicked off underneath Washington State and is expected to reach B.C. any day now. The roughly two-week long phenomenon happens when seismic stress shifts onto the fault area where the Juan de Fuca and North American plates lock together. 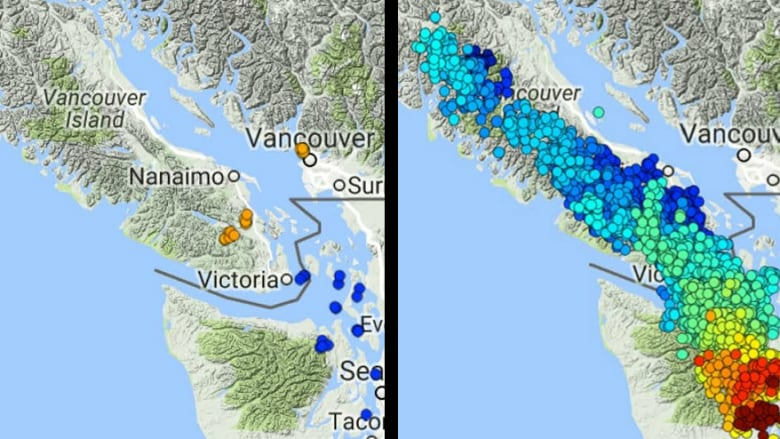 That causes thousands of mini-tremors and heightens the likelihood of a major earthquake event in B.C., according to seismologist Alison Bird. "If that locked zone is close to critical, and you add more stress on to it ... that could trigger, theoretically, the 'megathrust' earthquake," said Bird, who works for the Geological Survey of Canada. As for how much more risk that is, she says it's been likened to the increased risk of driving in rush hour traffic. "Going for a drive in the country on a Sunday, you're not that likely to be in a car accident. But if it's rush hour in Vancouver and there's a game on ... you're more likely to be in an accident. You're not necessarily going to be, but the probabilities are higher." The tremors caused by the slip are different from routine earthquakes that occur in the Pacific Northwest, and they aren't felt on the surface because they originate so far underground. "We look at a tremor as sort of a slow earthquake ... it's like you stretch a magnitude-3.0 earthquake over an hour-and-a-half," Bird said. During the last slow slip, which began in late December 2015, around 8,000 mini-tremors were recorded. Two earthquakes off Vancouver Island and near Seattle, Wash. on Wednesday night aren't "at all related" to the slip because they happened away from the locked-zone region, Bird said. She said the phenomenon almost serves as a calendar reminder to British Columbians to be prepared. "We are living in a seismically active area. We will have damaging earthquakes — they're guaranteed," Bird said. "A lot of people use that cycle to remind them to check on their kit, to review their plan, that sort of thing. "It's a good 'prompt' to make sure you're ready for an earthquake when it happens."